Not long after the state Senate booted Gov. 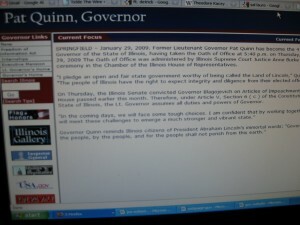 Rod Blagojevich out of office Thursday afternoon , the state of Illinois wiped clean his image on the official website and declared Lt. Gov. Pat Quinn the new man in charge. SPRINGFIELD – January 29, 2009. 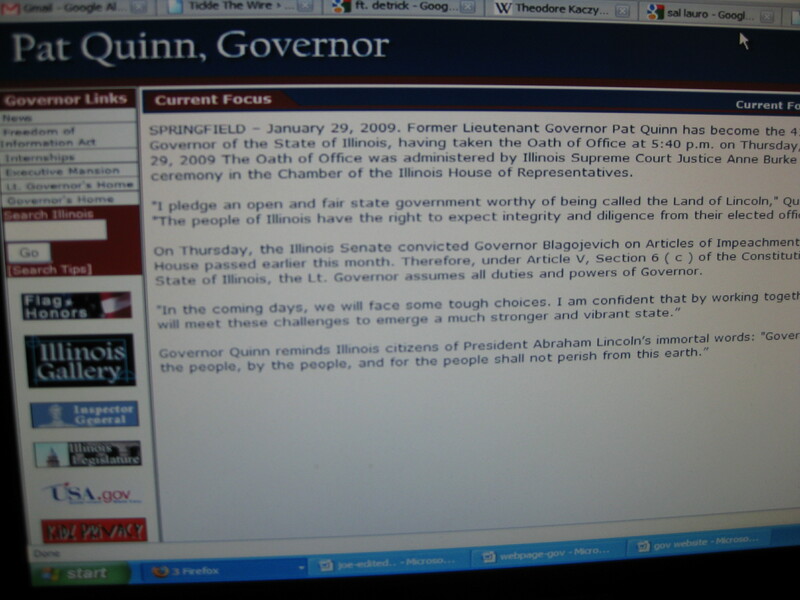 Former Lieutenant Governor Pat Quinn has become the 41st Governor of the State of Illinois, having taken the Oath of Office at 5:40 p.m. on Thursday, January 29, 2009 The Oath of Office was administered by Illinois Supreme Court Justice Anne Burke in a brief ceremony in the Chamber of the Illinois House of Representatives. On Thursday, the Illinois Senate convicted Governor Blagojevich on Articles of Impeachment the House passed earlier this month. Therefore, under Article V, Section 6 ( c ) of the Constitution of the State of Illinois, the Lt. Governor assumes all duties and powers of Governor. Posted: 1/29/09 at 10:04 PM under News Story.